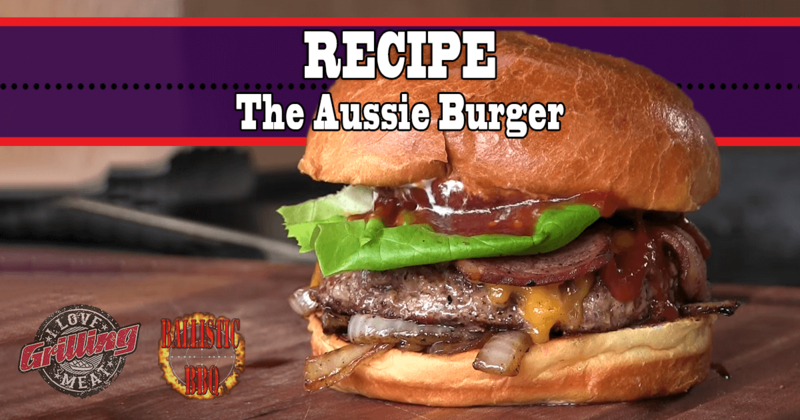 For this grilled burger recipe, there’s no better choice than using grass-fed Angus beef. If you have the tools to mince beef at home, get yourself a juicy ribeye and grind it to what will become an epic burger! Alternatively, ask your meat provider to grind the beef for you. Use about 10 oz of minced beef for each patty. Next up, it’s time to fire up your grill! If you own a flat top grill, use that, but this can easily be done on any traditional grill. Lay down some vegetable oil, and throw the chopped onion on there to give it some slight color. Sprinkle with some sugar to add a sweet note to the burger. When they are ready, place them in a cast iron skillet and move that to the side of the grill furthest away from the heat (to keep it warm, without over-cooking). Now the recipe calls for the use of Australian short cut bacon. This might be hard to acquire in many places though· if you can’t find it, use Canadian bacon. A couple of strips should be enough for each burger. When they are ready, move them to the skillet with the onions. Wow, that is a great looking burger! Will have to try it and maybe add a little heat with some jalapeno peppers.